Shown above is a picture of the AC97 from 1936. 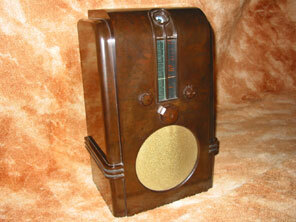 This receiver was housed in one of the most stunning of all the Ekco bakelite cabinets. The cabinet was designed by Jesse Collins, and is the tallest radio, (at 21” high), housed in a bakelite cabinet that I know of. The cabinet is quite susceptible to damage because of its size and the large continuous areas of flat un-contoured bakelite. The cloth covering the 9” speaker, unlike previous Ekco receivers, is completely unprotected by bars or mouldings, hence the cloth is more often than not found to be damaged or a replacement. Fortunately the cabinet and cloth on my receiver are both in good original condition. Like the ACT96 on the previous page, the AC97 has its power supply section on a different chassis to the main radio chassis. The power supply including the mains transformer, smoothing capacitors and rectifier is mounted at the base of the cabinet, and is connected to the upper chassis by an eleven way cable. 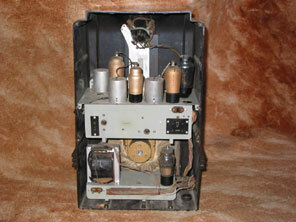 The circuit of the AC97 was designed to produce a high quality sound, and this was the first and only Ekco receiver to include a fidelity control. The fidelity control was basically a three position switch mounted at the front right of the cabinet.. Ganged together with the fidelity switch are the further contacts that decrease the upper frequency response of the receiver. Also provided for the first time was a “mystic eye”. This was Ekco’s term for the more commonly known “magic eye”, a cathode-ray display that indicated when a station was accurately tuned-in. Unlike most manufacturers though the mystic eye was not discretely and unobtrusively placed within the tuning scale area, but right above the tuning column at the top of the cabinet, so that the green glow is visible from the top and front of the receiver. When the receiver is operated in a room with subdued lighting the effect is quite stunning, with a vertical column of light from the tuning scale, crowned with the mystic eye and its phosphorescent green aura. The cabinet itself is a monument to Art Deco design, and the similarity of the stepped sides at the top are apparent when compared to buildings built in the 1930’s, such as the Crysler Building in New York for instance. You might also just be able to see that the knobs are octagonal, rather than the more usual round shape. Also notable of the AC97 is the output valve which utilises a 2v heater. As the rest of the receiver is using fairly ubiquitous 4v heaters the result is that the output valve cannot be placed in the normal heater chain. Instead the output valve is provided with its own 2v winding from the mains transformer. When you consider that as well as the 2v O/P valve heater tapping, the 4v general heater tapping, the independent 5v rectifier tapping, and the HT tapping are all required to be supplied from the mains transformer, it is something of a problem if the mains transformer fails, as scavenging another from a scrap receiver is not so straightforward. In fact when I first obtained my example, the mains transformer had obviously failed (decades ago), and a more common transformer without the separate 2v tapping had been used in its place. This meant that an output valve with a 4v heater had been substituted. Fortunately I was able to find a genuine spare salvage Ekco transformer, and the output stage has been converted back to original. It has been suggested that Ekco used an output valve with a 2v heater because the noise level caused would be lower than that from a 4v heater. As much effort has been taken elsewhere in the receiver to eliminate noise (for example by the whistle rejector circuits) then this would seem likely. Certainly it would have been easier for Ekco to solely use 4v heater chain and output valve such as an ACO44 or PX4 etc. The AC97 valve line-up is FC4, VP4B, TDD4, ACO42, IW4/350, TV4. The receiver cost £13.2.6 and a black and white version was also available (the tuning scale surround and knobs were white).